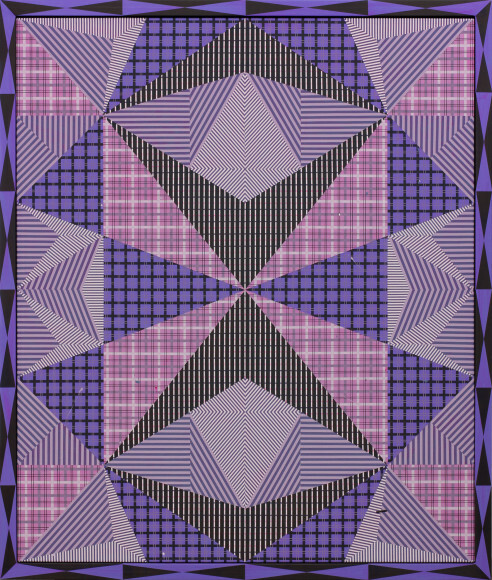 Douglas Melini, Growing Fragrant, 2013, Acrylic on canvas with hand-painted frame, 53.5 x 45.5 x 1.75"
The Schneider Museum of Art’s current exhibition, Breaking Pattern, highlights several generations of artists from coast to coast whose works investigate and advance the discourse around pattern, optical, and perceptual abstract painting. The exhibition features recent paintings by seven American artists: Gabriele Evertz, Anoka Faruqee, Michelle Grabner, Gilbert Hsiao, Douglas Melini, Brian Porray, and Michael Scott. Breaking Pattern coincides with the 50th anniversary of the Museum of Modern Art’s seminal exhibition, The Responsive Eye, curated by William C. Seitz. The curators of Breaking Pattern are respective artists themselves. The Museum presents in its Treehaven Gallery With You in Constant Conversation, an exhibition featuring two works: Sweet Like Candy to My Soul by Rossana Martinez and Zero-Sum by Matthew Deleget. This First Friday, the Schneider Museum of Art is making parking and visiting all the galleries easier and fun! On November 6, the Museum will extend its hours to 8:00 PM. In the buildings adjacent to the museum, patrons can visit the students’ open studios and the Center for the Visual Arts exhibition spaces. Campus parking behind the museum will be free to the public starting at 4:00 PM that day, and Allaboard Trolley will run between the Museum and downtown during the hours of 5:00 PM – 10:00 PM. This will permit a generous amount of time for First Friday audience members to park at the museum (no downtown parking hassle), see our exhibition and hop on the Trolley to visit their favorite galleries and restaurants with plenty of time to hop on and ride back to the University. The Schneider Museum of Art is putting a new spin on FREE Family Day! Guest curator, Ellie Leonhardt, has planned three special days this fall connecting community-based performance with interactive activities geared toward patterns and the theme of the Museum’s current exhibition, Breaking Pattern. The November FREE Family Day be Saturday, November 7, from 10:00 AM to 1:00 PM and will feature many movement and pattern-based activities, as well as performances. Activities can be enjoyed by people of all ages! The Schneider Museum of Art’s FREE Family Days are sponsored by an Economic, Cultural, Tourism & Sustainability Grant from the City of Ashland. Please call 541-552-6245 or email smaeducation@sou.edu for more information.